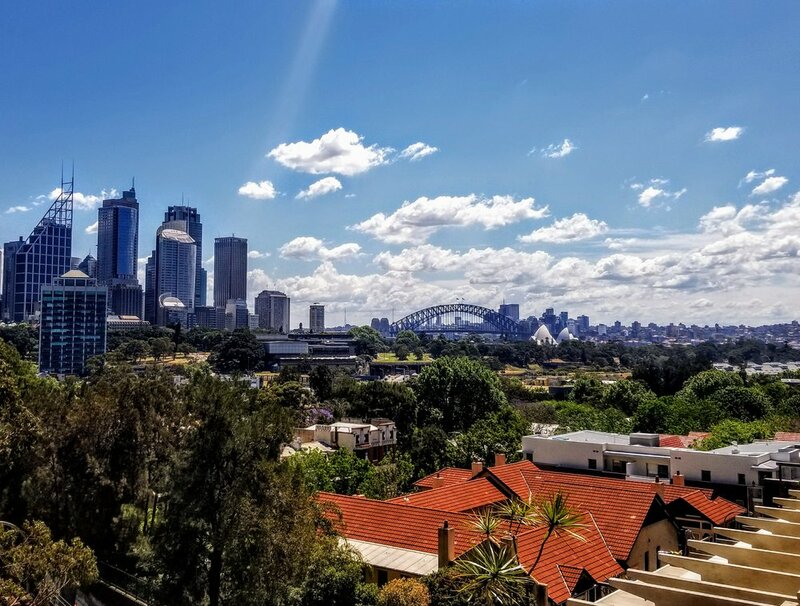 View from the huge deck of our Sydney Airbnb. One of my best finds ever. If you are new to the world of Airbnb, let me just say it will likely change the way you travel. No more tiny hotel rooms, tip-toeing around as soon as the kids go to bed. You can cook full breakfasts in your own kitchen and do laundry mid-trip. Even better, my family has stayed in some fabulous places for far less money than a hotel would have cost. It’s a dream if it all works out, but you'll also hear horror stories of Airbnb rentals gone wrong. Very wrong. Fortunately, this has never happened to me in 5 years of traveling, and I would like to think it is because I have developed a pretty good routine when searching for just the right vacation property. Finding a vacation rental usually requires quite a bit of time, so grab a glass of wine, a comfy spot on the couch, and follow the steps below to find your amazing Airbnb. Step 1: Answer These Questions Before You Even Look At Airbnb's Website. What Area Do You Want To Stay In? If vacationing in a small town, this question is fairly easy to answer. In large cities, however, you will need to do a little legwork beforehand to learn about the different neighborhoods. The Upper East Side in NYC is not the same as the Lower East Side and each have their pluses and minuses. I usually google “Where to stay in….” and read a few blogs to get a little background. I also make sure to study a map so I know the location of the tourist sights I want to see. In more rural areas, I use a map to gauge driving times to everywhere I want to go. Being familiar with the area and knowing where you want to be will help you narrow down the sometimes overwhelming number of options more quickly. If you are driving, then a parking spot will be a necessity on your checklist. If it’s public transportation, figure out what type of transportation you'll mostly use (train, bus, taxi, etc) and know the station/stop locations. My rule of thumb is to stay no farther than a 5 minute walk to the nearest public transport because it always raining, you are carrying something heavy, children are whining, etc. I begin my search with a range in mind: ideal number versus minimum number necessary for us to peacefully cohabitate. We usually end up somewhere in between. It is easy to get tempted by the price of a studio that has 2 sleeper sofas and blow-up mattresses, but you need to think carefully about whether that will actually be a fun vacation for your family or just more stressful. If you know your numbers ahead of time, I find it is easier to stick to them. Our great Airbnb on Capitol Hill in D.C. After some research, we decided to pay extra to stay on Capitol Hill because we were able to walk to most places and not have to rent car. Step 2. Click On Airbnb.com and Get Started. You can search without them, but chances are, your hopes will be dashed when your dream apartment turns out to already be rented. So, enter your dates beforehand--there is no reason to get your hopes up unnecessarily. Also, many places change prices according to the season. It is disheartening to find a great deal only to learn it costs 3X as much when you go back and input your dates. So start off with your dates, and you’ll have a much better overall idea of the typical price and availability of places. I always check this when traveling as a family. It means you have the entire lodging to yourself, instead of sharing the space with the owner. *** If you are supremely lucky and a multitude of places pop up after entering your dates and number of guests, then click on "Price" and set a maximum per night you want to pay. 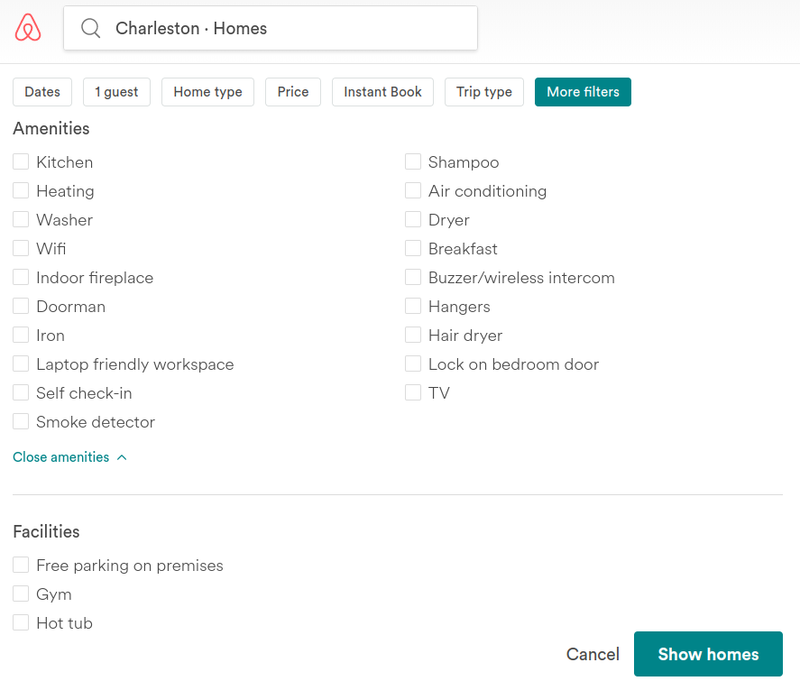 You can also hit "More filters" and then mark things such as exact number of bedrooms you want or only look at places with a washer/dryer. Adding a price limit and filters will narrow your results. I don’t generally set these at the beginning though, unless there are too many places for me to scroll through, because you might miss a great place that is simply lacking a washer. There are a lot of choices under " More Filters"
Step 3. Scroll Through Your Results And Narrow Down Choices Using These Metrics. Keep in mind that the price will be artificially low. Airbnb does not take into account cleaning fees, their fee, or local taxes when listing the per night price so the final price will always be higher. 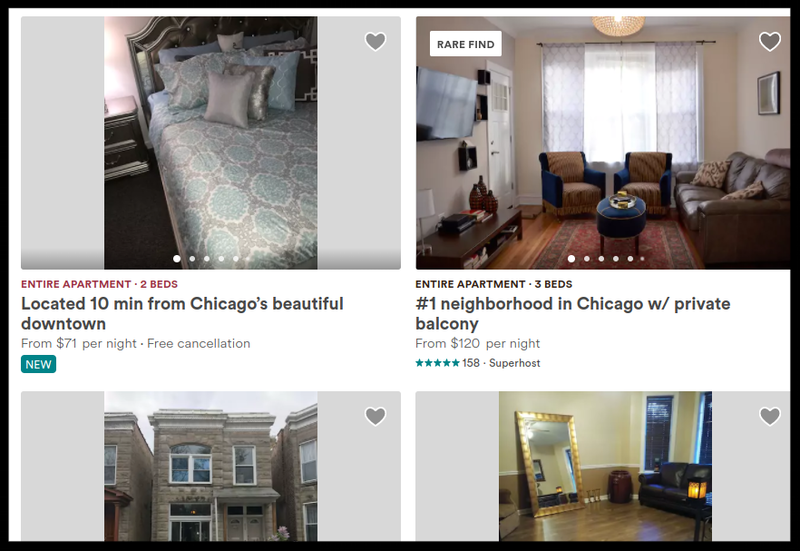 If you have a max of $1000 for a long weekend in Chicago, you are in reality probably looking for place around $200 a night. After price, this is my next weeding out metric and I won’t click on places with less than 4 stars. I also start with at least 20 reviews, although more than 40-50 are best. It is so much easier to deal with rental owners who have been doing this awhile. They have systems in place for check-in, check-out, and any problems that crop up, such as the AC goes out or you have lost the keys. New places without reviews are tempting because they often are lower in price, but I find that when traveling with children, I am more reluctant to be the first to find out that a place looks nothing like its pictures or has a live music venue downstairs. I would click on the one to the right first even though the one on the left is cheaper. It has 5 stars and 158 reviews. These people know what they are doing. Keep in mind that the number of bedrooms listed below the listing’s caption may be an exaggeration. Some people like to count a sleeper sofa in the living room as a bedroom. It is far more commonly done in Europe than the U.S. and is one of my pet peeves so watch out for that. Good places will have a clear description of the space and will state exactly how many bedrooms and baths. If amenities like WiFi or washer/dryer are musts for you, then look for them under amenities. Good places with experienced landlords have clear pictures of the bedrooms, kitchen, bath, and hopefully, the exterior. New hosts have artsy pictures of flowers on a windowsill that tell you nothing useful about the place. Also, you are looking for clear counter tops and floors. Experienced hosts don’t have a lot of clutter; it makes it harder to clean thoroughly and easier for your children to break something. Photos will tell you just about everything you need to know about a place- whether this is someone’s actual residence or a bare bones, short term rental-only apartment. I have stayed in both types and both are fine, but I like to know ahead of time what to expect. Other people’s reviews are hands down your best source of information. Read them all. They will mention the noise at night, how close the nearest grocery store is, whether the host was prompt with answering questions. If no one has stayed recently (within the last 6 months), that is a knock against the place. One or two people (out of many reviews) complaining about cleanliness is not a big deal for me as some people are just never happy or maybe the cleaner had an off day. Recurring mentions of cleanliness issues is a big negative however. Step 5. You’ve Found Some Listings You Like, Now What? 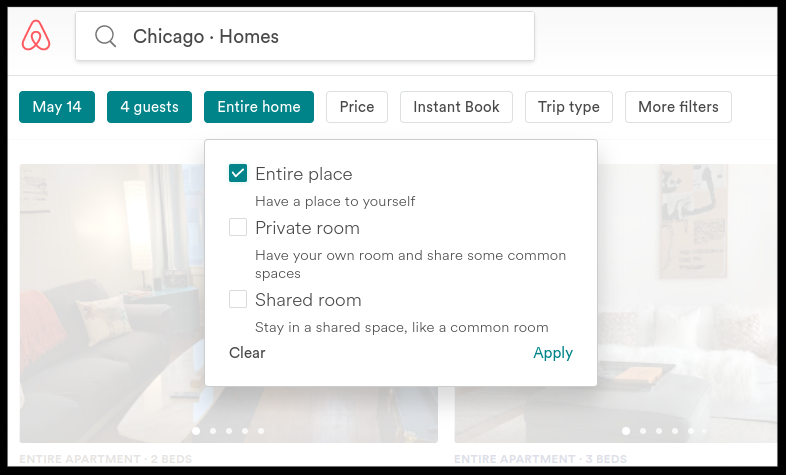 If you are signed into Airbnb, you can click on the little heart in the thumbnail image of a listing and Airbnb will then ask you if you want to make a list. Do this, it makes it so much easier to go back later and compare places. Or, you can share the list with others who may be going on this trip with you. All of them. I can’t say enough that this is your best source of information. I have learned about great coffee shops or nearby parks because of the diligent and detailed reviews people have written. I have also found out about the bathroom door that sticks or the malfunctioning oven. Take the time to read all the reviews. Airbnb gives you a map with a with circle indicating the area the listing is located in but the circle covers a pretty wide area, hardly helpful if you want to know if there is anything within walking distance or if there is trash dump next door. Between the pictures, hints in other guest’s reviews, and google street maps, I can usually pinpoint a listing’s exact location. Sometimes a too good to be true place for the too good to be true price is exactly that; it might be really far down a dirt road or a mile from the nearest bus stop. Or maybe there is an all night club next door. All things that might be the decider between one place and another. Check booking.com Or VRBO For The Apartment. Occasionally a place will cross list on other accommodation websites. The benefit is that other sites don't charge Airbnb's steep service fee so you can sometimes find it cheaper. Cancellation Policy. Most of the superhosts or other experienced landlords on Airbnb have a strict cancellation policy, meaning once you book you can cancel up to 7 days before check-in to get 50% back (minus service fees). A moderate policy where you have up to 5 days before to cancel for a full refund (minus service fees) is preferred. Check- in Requirements. The best option is a keypad entry set up and the owners just text or email you the code ( a code-opened lockbox containing a key also works well). This method is my favorite, because you can check- in at your convenience after a set time and no one is ever running late to meet you. The Rules. Read the House Rules to make sure there isn’t a particularly unusual requirement, such as no walking around after 10pm (totally saw this once). Mostly, the rules just stipulate check-in and check-out, no smoking, and no parties. Occasionally people ask that you don’t wear shoes inside which can be a problem for some families. Always read the rules carefully. If they ask you not to talk to the neighbors or lie to them. Airbnb rentals are becoming a big issue in cities as they are blamed for increasing housing costs for locals. Because of this, many cities have instituted strict regulations about short-term rentals in general. If a place is asking you to tell neighbors you are a personal friend, it is because they are violating these regulations and you are most likely renting an illegal listing. Renting a place like this is risky, because they may get shut down before your trip, leaving you with no place to stay. This happened to my family a week before a summer trip to NYC and I learned my lesson. Luckily the owner was able to put us up in another rental place, but we could have easily been left frantically trying to find accommodations in the height of summer. Step 6. Book Your Vacation! This is by far the most fun part. Send off your booking request and expect to hear back within a few days. Most places will ask you to tell them a little about yourself when you request to book. I simply tell them where I am from, who I am traveling with, and why we are heading to that particular locale. I think many of them just want to be reassured that you aren't having a "kegger" in their home. Some places have instant book, in which case, you will get your acceptance within minutes. After receiving an acceptance email from the owners, I would absolutely avail yourself of their local knowledge. Ask about favorite local restaurants, coffee shops, nearest grocery store, etc. Most owners are happy to share their favorite places and often have a guide already made out for their guests that they can email you. Hopefully this guide will help you feel more comfortable using Airbnb's website. I personally love using Airbnb to find vacation lodgings as you can stay in some wonderful places with a far more personal feel (and room!) than a hotel. It does require some time and effort though, but like many things in life, you get back what you put in.